We’ve won at the 9th circuit, and we’re gonna win at the supreme court, the only thing in doubt is whether we win small or win big. California, or the entire country, and the court may wait until one of the DOMA challenges before they want to address the case of marriage equality. It could however take a year before the court case is laid to rest, and I think that leaves us with an opportunity. I agree with all the arguments about we shouldn’t vote on people’s rights, and how racial equal arrive equality would never have been achieved at the ballot box. But I’m also a great believer in narratives. California was the last great victory of NOM and it was effectively the half time in this fight. Things have slowly turned towards the right side ever since. California is a special state, it’s one of the largest in the nation, and to many it’s a state full of hope and promise. A generation ago that’s part of the reason why our forebears went the to find a place to be safe. Our loss there was horrific and agonising and the day that foul odious and unconstitutional proposition is condemned to the dustbin of history the better. However there’s an narrative that the haters have, and that’s one in which marriage equality is against the will of the people in every state. I want to end that narrative, and California is the place to do it. I’m not a Californian and I don’t even officially count as an American, but I do have a stake in this fight as does every american who cares about their country. 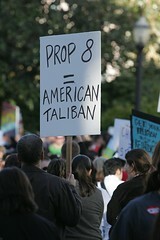 I want 2012 to be the year that California says “we were wrong to hate”. It sounds risky I know, but the narrative from that point would be clear, and it would give the supreme court all the momentum they’d need to declare DOMA and the state bans unconstitutional. Victory is in sight on this fight, and we can make a leap forward today. So as everyone who’s not been living under a rock for the past few days knows, that in a 2-1 vote the 9th Circuit upheld Judge Vaughn Walker’s ruling that Proposition 8 was discriminatory and had no justification for that discrimination and so was invalid. Of course from corner to corner of the country the anti-equality crowd is howling because they know that their “shining moment” was Proposition 8, it never could get better than discrimination in law in California, ostensibly by the vote of the people. They knew they could never win a victory sweeter than that. Of course they’d hope to get a federal marriage amendment but that was always a pipe dream. They know if they are honest that this is the beginning of the end, and it may take 20 years but equal marriage will happen in every state. However they are making a strategic error by appealing for the Supreme Court. As it stands they’ve lost the battle in California, but loosing at the supreme court could loose them the war. Sotoyamor, Kagin, Breyer, and Ginsberg are solidly pro-equality and the opinion handed to them by the 9th circuit and Judge Walker is one that they could apply to all such bans across the US from DOMA to the ban in Texas. Kennedy is always seen as the swing vote, and many on the right hope that his statements about marriage equality in the Lawrence vs Texas ruling mean he’s not in favour of marriage equality. However he made it clear that he feels that prejudice against gay and lesbian persons is not a universal constant and its well past time to move past it. Now if you look at the remaining members of the court, Alito, Scalia, Roberts and Thomas can any of them be taken off the board. Well Scalia and Thomas are known to have radical views on the constitution that seem outside the view of any other reputable constitutional scholar, and so even with the quality of the Walker ruling they can be expected to vote against marriage equality. So that leaves the two Bush Appointees, Alito and Roberts who were political appointees placed there as part of the long game to shift the court to the right. They have shown themselves to be generally conservative on most viewpoints, including some infamous ruling such as “Citizens United”. However both have been careful and measured on their viewpoints, neither having faced an issue of equality while sitting on the Supreme Court or prior to this as justices. What this means is that while there is some risk that the court might say that the Prop 8 ruling only applies to California, theres a possibility that they could see it as applying to all such discriminatory amendments and laws throughout the entire country. They have lost California, I don’t see any combination of justices that would rule that Proposition 8 was constitutional, but if they go down this route, then they risk bringing equality to every State in the Union. 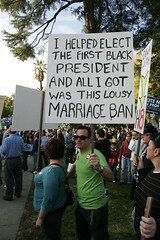 So here’s the rub, we screwed up big time in 2008, when we let Prop 8 pass. Yes, I know I’m talking about a campaign I was mostly only looking at from the peripheral before I really got involved in any activism. I realise that many of these actions happened before I had the bravery to walk down the street as who I am, but I use the term “we” to describe the equality movement as a continuous movement of which every brave soul who stands up, true to themselves is a part of. However despite all the work of the NoH8 campaign, the general mood of lgbtqiappqa people around California and the USA, was that Prop 8 had no chance of passing. I remember watching in utter disbelief as the results came in. In 2003 we had a move forward so basic and fundamental, that said something so utterly simple, that being gay was no longer a crime. The backlash as almost immediate, with the republicans using homophobic hate to fuel their re-election of a man who proudly admitted he would block any expansion of hate crimes if it protected gay people. If the equality movement had crumbled at every set back, the President might still be in chains, the Secretary of State might still be the property of her husband, and I would be either in prison, or dead. Instead of faltering, we began to fight back with a renewed passion, in part, because we knew if we did not fight, hate for our very being would be codified into the constitution. Massachusetts was the first state to legalize marriage equality, and we slowly made moves to bring in civil unions, domestic partnerships and in a few states marriage equality, when the event happened. 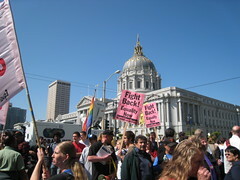 The California Supreme Court struck down the laws on marriage equality as discriminatory. Suddenly we had a victory, and it was an unmatched game changing victory. We’d won in one of our home states, and we could already smell DOMA on its deathbed. But from across the USA haters gathered, seething in their unholy disgust of ordinary americans daring to demand their rights. They came to California with their tax-exempt funds and loyal minions who thought they were doing the work of a loving god who wanted them to fight equality. Lies, mistruths and whispers were spread to scare people about the simple concept of equality. Those lies tipped the balance, and while we’d come a long way since the 70% vote in 2000. Now with my limited legal understanding, and with 5 minutes I can drive a truck through the constitutionality of Prop 8, and I have no doubt that once it gets to the supreme court not even Bush’s handpicked stacking of the court can argue that its just or constitutional to strip rights by majority rule. I agree that we can win this without another ballot initiative, but I think this time we have to put up up for the popular vote. 31 states have voted on our rights, and 31 have made the wrong choice, the un-American choice, and a choice will stain the reputation and soul of every one of those states even more perhaps than those who had anti-miscegenation laws on their books. The religious right uses it in every argument, in every case, that it managed to bring intolerance to every state no matter how blue it is. This is a war, but not of weapons and power, but one of ideas, on one side there is hate, cruelty and ignorance, and the other is a side of love, compassion and wisdom. We had a huge victory in New York, thats turned the tide against NOM and its allies, across the country from deep blue to faintly red states are talking about marriage equality, not to mention the Repeal of DOMA is being talked of and supported by significant politicians who were too cowardly to do so before. I don’t want to fight a war, I want to find the right words to melt the most bigoted heart, and I’m still looking for those words, but as I’ll write in another article, about my experiences trying to communicate with the heathen has worn even my godlike patience to the point at which I acted in a way that I’m not exactly proud of. At stake is more than our own selfish interest, its for the interest of every single LGBTQIAPPQA youth out there who’s vulnerable and alone because they are surrounded by christian fundamentalists, in deep red and even deep blue enemy territory. Its about telling the world that you are marrying the person you want to spend the rest of you life with. Its about building a life with someone and not having to carry around legal documents just to prove that they are your spouse. Its about employers respecting your family just the same as any other family, in sickness, and in health. Its for when that bond is strained by illness, and eventually snapped by death, and being treated the same as any other widow, by your friends, your town, your state and your government as every other new widow struggling to make sense of the life they have lost. Its about our children, and our families being given the same rights, and treated with the same respect as others. So my fellow champions are you prepared to fight the next hard battle and take us one step closer to the victory of true equality.We’ve got to risk a lot of support, a lot of resources on a battle many think is already won.But we need to win it in a way that they cannot dismiss, they cannot rubbish and they cannot ever hold over us again. California needs to vote, not because the vote is politically, socially or constitutionally ready, but because California needs to put right the contamination of hate that the people tried to put into their constitution. This is a strategic battle for the hearts and minds of every American be they be living true to themselves in the Castro, or hiding from themselves filled with self loathing on the Focus on the Family church campus. There is no stronger signal that can be sent, than for California to vote unequivocally for equality. 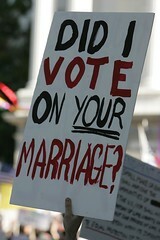 We need some hope and a symbol, and thats why we need to put the repeal of Proposition 8 on the ballot in 2012. We can and we must take California back. Here’s the legal analysis provided by John Yoo, counsel for George W Bush on the Proposition 8 ruling by Judge Walker. I know that John Yoo is a war criminal, and should have been long ago disbarred for intentional bad faith legal work on creating a legal shield for the torturers at Guantanamo Bay. However he still represents the right wing of legal thought, and so its interesting. His admission that if you decriminalize being gay (which few people seem to remember only happened in 2004), you have to legalize marriage equality was interesting, however his tone and speech suggested he would support trying to reverse Lawrence vs Texas as part of a larger strategy to stop marriage equality. The tired argument of enforced equality has been used time and time again by people trying to stop the march of equal rights. The courts have interpreted and moved ahead of the populace many times throughout US and legal history. The other thing they seem to ignore is the question of the difference between an amendment and an addition to the California constitution, and whether the actual ability of a simple majority to strip a minority of the rights exists. All in all it was a weak lackluster analysis of a legal issue that is what you’d expect of hack lawyer like Yoo. Mark Leno on LGBTQIA history being taught in schools. State senator Mark Leno of California is proposing that we teach our children about LGBTQIA history the same way we have Black History, and Women’s History. He makes it clear and unequivocal that this is a matter of civil rights, and a clear continuum for LGBTQIA rights being the next stage in the civil rights process. It is clear that those who oppose equality are just the same as those who opposed Black History, and Women’s Studies because they were bigots, just the same as this lot. California has already stepped up the the problem of LGBTQA bullying with measures such as SB 48 which states that social studies should cover the positive contribution of LGBTQA people on the country and society. However they are moving forward with more measures such as AB 620 which creates an anti-bullying policy that should make schools and colleges take issues of lgbtqa-phobic bullying seriously. Surprisingly the anti-equality forces in California are worried because it will mean that the bullying that happens against LGBTQA people on campus will be noticed, reported and dealt with. They miss the days when both the teachers and students would openly bully LGBTQA people for being “different”, and they know that its far more difficult to hate people who you know and understand. The so called California Family Council are saying that its going to oppress christians, because lgbtqa-phobic behavior is natural and normal for children and they should not be punished. The SB 48 Bill raised this almost protocol of zion like response from Father Joh Malloy saying that the primary contribution of LGBTQA people is the destruction of society. If you see it as a vital part of your faith to be allowed to browbeat your fellow students with religious dogma, targeting those who have the audacity to not only not listen to your bile, but dare to want to live proud and noble lives, then yes this policy is going to get in the way. Just the same as a white supremacist cannot abuse people of different skin colors in a school environment you cannot abuse LGBTQA people without consequences. The religious right knows that if they loose this generation of their youth to openness and tolerance, that they will be the last generation that is so full of religious hate. Here’s the advert for True Tolerance a project of James Dobson’s group the focus on the family. The agenda is clear with this this site, it is to trivialize the real problem of bullying of LGBTQA people, to suggest that there are minorities who are subjected to far worse bullying so you can ignore the woes of LGBTQA youth. California is not listening to this rhetoric, they are continuing to push forward against the plague of bullying with the support of the teachers, parents, and students, hopefully leading the nation in moving forward. When California legalized equal marriage in 2008, I really felt uplifted, one of the two homes of equality now recognized equality in law. I then heard rumblings about Proposition 8, and assumed unwisely that it would fail to get on the ballot, let alone pass. I had not reckoned with the forces of hatred and intolerance unleashed by conservative christians. It felt as though at the moment the country was walking forwards into a brighter better future, we were yanked back, it honestly made me feel sick and despondent. However we had to pick ourselves up and start moving forwards. My understanding of the California constitution, makes it cut and dried, the proposition was unlawful, it was a change to the nature of the constitution, and so should have needed 2/3rds majority. It should have been struck down on principle by every court of the land and i’d cheer that. However I don’t think for once that’s the right way to go. I think we need to refight the battle we lost and win the war. The numbers ended up at 52 for 48 against, I think we can win, and we can win big. Throughout the US every time its come up for a public vote, hatred and intolerance has won on the issue of marriage equality. This does not mean our time has not come, it means we have not out fought the religious right yet. While California is not the liberal utopia we’d love it to be, its still the home of San Francisco, our Vatican, our Mecca and our Shangri-la. So its time we take California back for equality. We need to put marriage equality back on the ballot for 2012, we need it to be our issue, we need to fight the fire of the Mormons, the Baptists and the other haters with the water of the truth. We have the money, we have the power, and we can win. I’m sure some would talk against this idea as risky, but I think we need an unequivocal victory against intolerance. We need an example to hold up when NOM comes out and says “We always win when it comes to the ballot”, and i think thats worth the risk to start the march towards marriage equality at the federal level. We can win, we must win, and we have to step up to start the next battle.